When someone makes a discovery of something, the first person gets credited with such a discovery. That’s how it works with Science and patented inventions. The same can also be applied to anyone who authors a book. If you read something that sounds quite similar to a previous work, people think the material might be plagiarized. We live in a world that needs papers and figures to prove legitimacy. Apparently, according to one humanist article, credit cannot be given to the origin of the Golden rule on the basis of seniority. 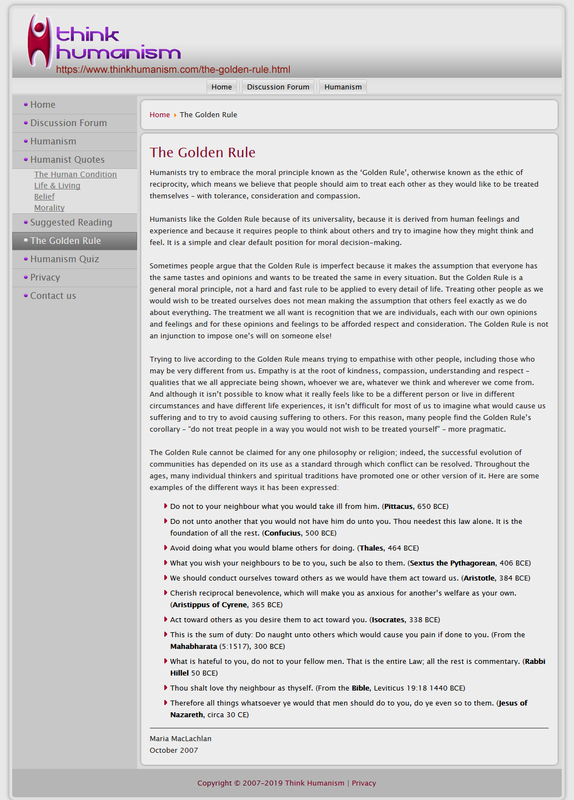 If the original poster is right with her assertion that “The Golden Rule cannot be claimed for any one philosophy or religion,” let’s put it to the test simply by taking a look at the dates she conveniently cited for the readers. We must look for the first source known to have come up with the concept (think seniority here). Interestingly, the writer of the article did not bother to objectively arrange it in its proper chronological order. I tweaked the screen shot with the numbered order and underlined #1 for emphasis. I give her credit even though it must have made the author uncomfortable it was done in a way to obscure the truth by her deliberately putting what was meant to be at the top second to last. However, I find it interesting how number 1 and number 11 are arranged next to each other as they actually coalesce since the God of the Old Testament is the same as the God of the New Testament, showing the fulfillment of the Law. If we are to go by seniority, clearly, the God of the Bible should be credited as the origin of the Golden Rule. People cry foul when they do not get recognized and given credit they deem to be rightfully theirs be it in Books, Music, technological inventions etc. Let’s be consistent, shall we? We are to give credit where it is due. Apart from God, there is no such thing as Morality.